eMediaWright attended another Comicon in Miami. The Miami Supercon. Four days of non stop activities and workshops. ; Lots of fun as usual. 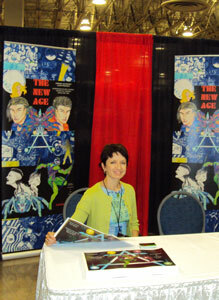 Maria and myself were there to provide marketing support for the Art in Effect Team as we continue to lay the foundation and create awareness for New Age Graphic Novel. As an added bonus The Art in Effect team took us out for dinner to The Capital Grill in downtown Miami. Ooh Awesome food. We also got a bit of extra time to poke about South Beach. We gave away a thousand plus free posters and lots of T-shirts to fans of Art in Effect, all in anticipation of two, 5 pages preludes soon to arrive online later this fall. While eMediaWright was at the show helping marketing the event, a big part of our presence was to gather more research for the “Oohawe” Graphic novel reading platform we are developing. eMediaWright through its Oohawe Software division is building a web comic and graphic novel reading framework that will allow the reader a better mobile “oohawe” experience when reading the story. We will soon be announcing when you can view this new online novel.